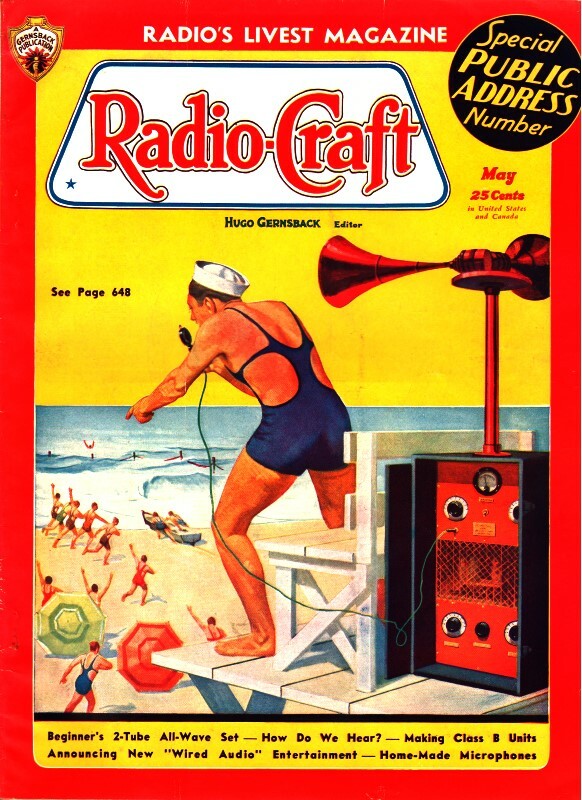 This is another Radio Service Data Sheet that appeared in the May 1936 edition of Radio-Craft magazine. 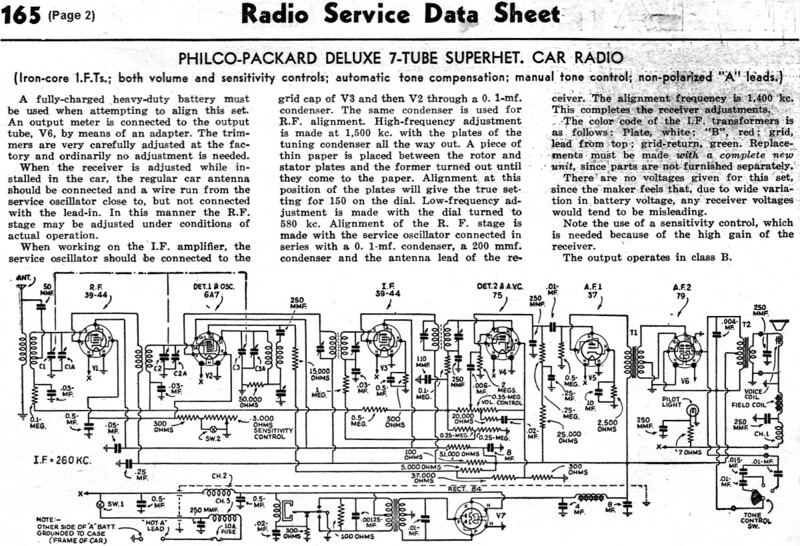 I post this schematic and functional description of the Philco-Packard Deluxe, 7-Tube Superhet Car Radio manufacturers' publications for the benefit of hobbyists and archivists who might be searching for such information either in a effort to restore a radio to working condition, or to collect archival information. A fully-charged heavy-duty battery must be used when attempting to align this set.An output meter is connected to the output tube, V6, by means of an adapter. The trimmers are very carefully adjusted at the factory and ordinarily no adjustment is needed. When the receiver is adjusted while installed in the car, the regular car antenna should be connected and a wire run from the service oscillator close to, but not connected with the lead-in. In this manner the R.F. stage may be adjusted under conditions of actual operation. When working on the I.F. amplifier, the service oscillator should be connected to the grid cap of V3 and then V2 through a 0. 1-mf. condenser. The same condenser is used for R.F. alignment. High-frequency adjustment is made at 1.500 kc. with the plates of the tuning condenser all the way out. A piece of thin paper is placed between the rotor and stator plates and the former turned out until they come to the paper. Alignment at this position of the plates will give the true setting for 150 on the dial. Low-frequency adjustment is made with the dial turned to 580 kc. Alignment of the R. F. stage is made with the service oscillator connected in series with a 00.1-mf. condenser, a 200 mmf. condenser and the antenna lead of the receiver. The alignment frequency is 1,400 kc. This completes the receiver adjustments. The color code of the I.F. transformers is as follows: Plate, white "B", red; grid, lead from top; grid-return, green. Replacements must be made with a complete new unit, since parts are not furnished separately. There are no voltages given for this set, since the maker feels that, due to wide variation in battery voltage, any receiver voltages would tend to be misleading. Note the use of a sensitivity control, which is needed because of the high gain of the receiver. The output operates in class B.